So.. if there’s one question I get often in Second Life as a blogger, photographer, and author is.. what inspires me to be able to come up with so many different outfits. Well, in all honesty, that’s a good question. Sometimes it’s new releases, sometimes it’s my mood, it could even be a song! However, there’s one crucial point that many people take for granted – the power of a pose. You want to know what inspires me a lot? A pose. Now now.. I know what you’re thinking. I’ve gone bonkers. But it’s true! I mean.. I could not think of a better way to prove this theory than with the new release of Hopscotch for the Arcade event. So.. yes, I’m going to be doing an article about poses! Believe it or not, as a blogger and photographer.. finding the right pose is at times harder, and more important than finding the right outfit. 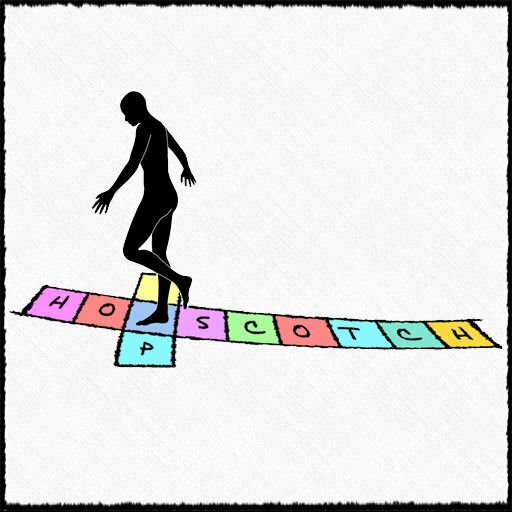 Where to start.. first off, let me say a little about Hopscotch. For the longest time, since I started doing photography.. well.. okay, maybe not so long, a year or two tops. Anyways! I always counted on the familiarity of the name “Hopscotch”. Now.. there are many big names now, Exposseur, Bang! Frooti, Glitteratti, and oOo, however.. there’s one major factor that sets Chandni Khondii apart from all these different stores – she is a major dork. Now, I don’t mean this as an insult! Far from it! I mean.. if anyone could give her a run for her money, it would be me! I mean.. her poses, everything, they’re about personality, and this round of Arcade goodies and poses really showcase this. So.. this week, we’re going to be doing things differently. I’ve done two sets of pictures, one of them is an action shot, using one of Chandni’s amazing dorky poses, and another showcasing the clothes that those poses helped inspire, and giving you full credits to that outfit so you can copy the look! Let’s start with.. Star Trek! Now, I might actually get shot for saying this, however.. I have never cared for Star Trek that much. I know at least one person that will read this and will cringe and have happy murderous dreams starring me as his victim, however! I have always enjoyed the hype about it. Call me fake, call me whatever, I just enjoy the fandom of it! The show.. I’ve tried, it makes me sleeping (and again, I’ll get shot for this) Just like Lord of the Rings. But.. when I got this rare prize playing the gatcha at the Arcade, I couldn’t help getting inspired to make this whole article! So that’s how it goes! You see a pose.. you get an idea for a picture, and then everything just comes together! And so we move on to now.. Potter! I’m a total Potter fanatic, so.. this one came extremely easy! Like I said, this one came extremely easy, and in SL, it’s just.. uber easy to get Harry Potter themed things. This is interchangeable, you can do any house you like, Boom has vests in every house, and the tie comes with an HUD that allows you to pick your house. I just chose Slytherin because.. Duh.. that’s where all the cool kids are! Alright.. so .. I did say that I was a dork, right? Major one? You’re going to get to know so much more about me personally through this.. This one is Doctor Who. Fezzes are cool, so don’t judge. SO are bow ties. And I do know that the crying angels have nothing to do with this episode, however, they’re my favorite creepers. More so than Daleks, so I had to add an angel! Anyways, on to the poses and inspiration! Okay, so this one might not be too well known, but it’s also one of my favorites. Come on guys! 42? So long and thanks for all the fish? I think if Arthur were a woman, he’d be wearing this.. however.. I wonder how Zaphod and Trillian would be.. Oh well, this is nothing more than some Hitchhiker’s Guide to the Galaxy inspired clothes, inspired by the pose! Okay, so this is the last of my personal favorite fandom, and it’s Game of Thrones. The pose is a rare.. and I should mention, that all the props on the main picture are included! Like the wand in the Harry Potter pose, and the fish and the towel. The chair for the Captain, I mean.. everything you need to make your picture really pop! However.. the tardis is not included with the doctor, you can, however, find a different one with awesome poses in the main store of Hopscotch! So.. on we go.. my favorite character.. to everyone’s horror, possibly, is Cersei.. she’s such a strong woman through it all, that sass, and she seriously makes the show with her son.. so I couldn’t pass the opportunity to find my way to King’s Landing as Cersei! This picture is all about LARP, or.. Life Action Role Play. Personally, I’ve never done it.. but I guess I have done enough role play through my years in second life to count as a dork on this too.. Ah well. When I saw the props for this pose.. all I could think of was something badass in the woods, cute though, of course, I mean.. it’s me after all, you can bet your last dollar I’ll do it in a very cute and gorgeous manner! (No, I’m not conceded, I’m just sarcastically amazing.) So.. I came up with this little number that I hope you like! And last but not least.. every dork needs reinforcements! We get picked on a lot! So you always need a friend next to you, always! And who else to have next to you but one of your best friends? I was luckily able to kidnap my friend Clio Clary, and drag her along into my room…. to play video games! It was the perfect ending to a hard day of dorking around with my Narnia (Or what I like to call my inventory now thanks to a couple friends) and my Hopscotch poses! This last pose is also a rare one from the Arcade. I know this post was longer than usual, but I hope I could teach you just how to be able to use your poses to help you create a unique opportunity with your wardrobe. I leave you with these credits, and I hope that you’ll be able to visit the Arcade for all these amazing poses and more! Like the amazing piggies, and the awesome jewelry and headbands from Disney.. and umm.. burn books, and doggies, and 50L cars! Yeah! And 100L scooters. Go hurry while you can and get all these goodies. And if your linden are still jingling in your pocket after that, visit Hopscotch and take out the extra weight!